The game of AFL Masters Australian Football (AFLM) provides the opportunity for players 30 years and over to enjoy the game of Aussie Rules Football in a safe, supportive, family oriented and fun environment. AFL Masters North Coast get together once per month (on average) during the footy season. Teams are organised with the available players on the day, meaning there’s no commitment to training or to playing week in, week out. The whole emphasis is on fun. We don’t play for sheep stations, AF:L Masters North Coast is all about a group of guys getting together, having a run and a laugh, and reliving the “glory days”. 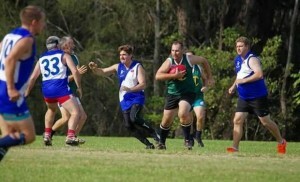 To learn more about AFL Masters North Coast please contact Dan Perry on 0423 286 282, send an email to northnswaflmasters@yahoo.com.au, or jump on the Facebook page.